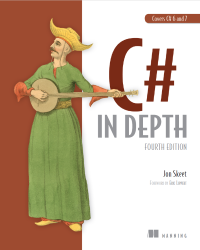 Here's a more detailed table of contents for the third edition of C# in Depth than the "about" page can reasonably be expected to provide. Part one provides a brief history of the language. Part two describes C# versions 2 through 5. This is effectively a rewritten and condensed form of the third edition of this book. Part three describes C# 6 in detail. Part four addresses C# 7 (all the way up to C# 7.3) and completes the book by peering a short distance into the future. 13.1 Recap: What do you know about ref?